I had a strange week last week, a few things have become patently obvious to me. You know that feeling when something you’ve known for a long time hits you right between the eyes. ...I have far too much time on my hands. Yes, it’s an absolute privilege, I feel very lucky to have the life I have, and it’s 100% a first world problem, ‘oh poor little me’ I have “too much” free time, nonetheless I have decided to change a few things. There’s no point in recognising an issue if you’re not prepared to do anything about it. Humans need purpose and without children to tend to now I’ve become redundant. It’s time to go find a new reason to put my face on and go out into the world. First things first I’m changing my car, I was driving round in a 7 seater Discovery Sport, just me, on my own, alone, why on earth would I be driving a classic ‘soccer mom’ car all by myself? My children are just about to turn 20 and 22, they both drive and are hardly ever home. It’s bad enough that my nest feels empty with the boys all grown up and in no need of me, without compounding it with an oversized but empty car hahahahaha. So first things first I’m changing that. I have put out some feelers for some sporadic work, I don’t want anything full time or part time even, just occasionally so my brain doesn’t turn to mush. I have come up with a few possibilities, so that’s exciting. I have also asked to be considered as a volunteer on a new endeavour by a bowel cancer charity, which is still in the pipeline but a much needed service that I’d very much like to be a part of. Bowel and Cancer research are planning to start a buddy system to provide trained support to the newly diagnosed with bowel cancer, it’s a fantastic idea and I’m sure it would’ve have been of great use to me way back when. I was an absolute wreck when I was first diagnosed and given my treatment plan, traumatised doesn’t even begin to cover it. At a time when I should have just been solely focusing on survival my mind was taken up with the fear of death and then the fear of living - with a bag. I couldn’t picture it in real terms, I couldn’t see it as a positive. In fact it was only when I woke up from my AP resection surgery that my mind had done a 180 and I fell in love with my little red blob of a stoma. (No I didn’t name it, never have done, I’m terribly pragmatic and unsentimental, I’m on my 3rd wedding ring with the same husband for heavens sake, sentimental I am not hahahahaha). But I did feel emotional towards it and I appreciate my stoma, I love the life it’s enabling me to lead. I never forget how lucky I am to still be here. I am and always will be eternally grateful to that little red blob, the team of doctors that created it and to the research into bowel cancer. (If you go to www.bowelandcancerresearch.org there's a brief questionnaire that would be of great help if you filled it in). And finally I decided to cook, properly cook! This is unheard of in my house really, I’m a brilliant reheater and salad maker but real cooking? Not so much. I think that cookery demonstration that we went to sparked something in me. And then the perfect storm occurred last week, the weather changed and the temperature dropped, so I could bear to put the oven on and I felt a bit bored (I hate that word, only boring people are bored my mum always told me as a child), so I went off to the shops to collect everything I needed. Chris arrived home to a Stepford wife (probably a dream come true for him hahahahahah) and delicious cooking smells eminating from our usually dormant but beautiful kitchen. It was a spectacular success, even if I do say so myself. Chris and Sam loved it too. Chicken with peaches and lavender, with fine beans and hazelnuts. We had a lovely but chilled weekend, time spent with friends eating, car hunting and more eating with friends, plus pottering around the house getting much needed, 2 person chores done. Top From Whistles, Jeans ~ Joni’s from Topshop, Shoes from Tods. I also did a little internet browsing, I’m not sure if scrolling through Insta can be deemed a hobby but a few weeks ago I was tagged in a repost of one of my blog photo posts. 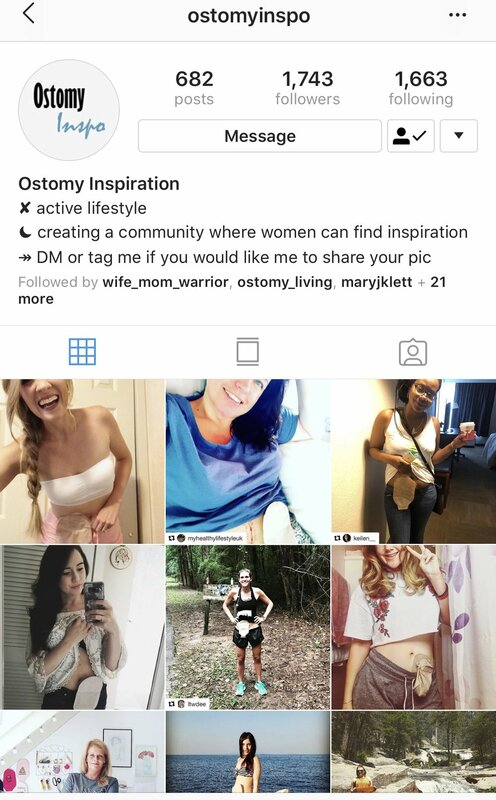 I hadn’t heard of the account before and it came as something of a surprise to see myself staring back at me when I hadn’t posted it, but it’s called ostomyinspo and it’s a collection, an anthology if you will of many and various women with stomas giving positivity and insight into the world of colostomy, ilesotomy and urostomy life. What a brilliant idea to bring them all together under one roof. How empowering for anyone facing ostomy surgery to know there is life after a bag. I can’t help but be delighted that my photo got 129 likes so far either. Not for the likes themselves, (likes are largely irrelevant in the real world really aren’t they, I’m not 17 trying to win a popularity contest...I didn’t then and I wouldn’t now hahahahaha) but for the exposure its given my blog it’s brilliant! These likes will lead to extra footfall to my blog, which in turn may mean someone in a state of distress at learning they have to have ostomy surgery can see that life can be even better than it was pre bag. I may well have realised I’m a little lacking in something to do but it’s certainly not stoma bag related. My life can be as full and as busy as I choose it to be BECAUSE of my life saving colostomy bag. There are hundreds, thousands of incredible women, and men out there raising the awareness of stomas (just to clarify, 'Stoma' is the collective name for a hole, be it a colostomy, ileostomy or urostomy). You can lead a very good life bag and all. There’s another site that’s very close to my heart, called Kindred Box, mainly because I have such a blessed life, I have an incredible support network of amazing family and incredible friends...you know who you are ;) but also the NHS takes the financial burden of my colostomy away. (Ok so it would have been better had my GP’s had sent me for further testing some 10 years before they did, but without a time machine that's a wasted want). But as it stands the NHS provide all my supplies free of charge, to my door. This is truly a privilege. In other countries it isn’t always like that, and that makes my blood run cold. Unless you have very good insurance cover you can be left each month with a very low amount of supplies provided or in some cases NO supplies at all. I can’t imagine my life with a colostomy but nothing to attach to it. The hell doesn’t even bear thinking about but that is the reality for some. So the wonderful Christine Kim from OstomyConnection (another very worthwhile and brilliantly inspiring social media account providing support and inspiration to stoma users) started a charity called Kindred Box. Which provides stoma supplies to those in need. I did donate to this cause a while back, it deeply saddened me to learn of people so desperate that they had resorted to carrier bags and duct tape to contain their waste matter, let that sink it for a minute...whether you are bagged or not, can you imagine the abject horror of that, of the life that you would be able to lead without real stoma supplies. Christine is doing wonderful things with both her endeavours, Ostomy Connection and Kindred Box, find both on Twitter and FB, She is amazing, although I have never met her I admire her greatly. She’s getting out there making a difference. I am in awe, and hopefully soon I will be able to do my bit when the bowel buddy initiative is up and running. * Oh oh!! I nearly forgot to say! The U.K. government have decided to finally reduce the screening age for bowel cancer from 60 to 50, in line with Scotland. This is very good news, and if you’re lucky enough to get a stick in the post to poop on then grab it with both hands...before not after hahahahaha. Screening saves lives, better still to reduce it to 20 or 30 but 50 is a good start.